I have to say, I thought doing Careless Torque was a bit of a pipe dream. 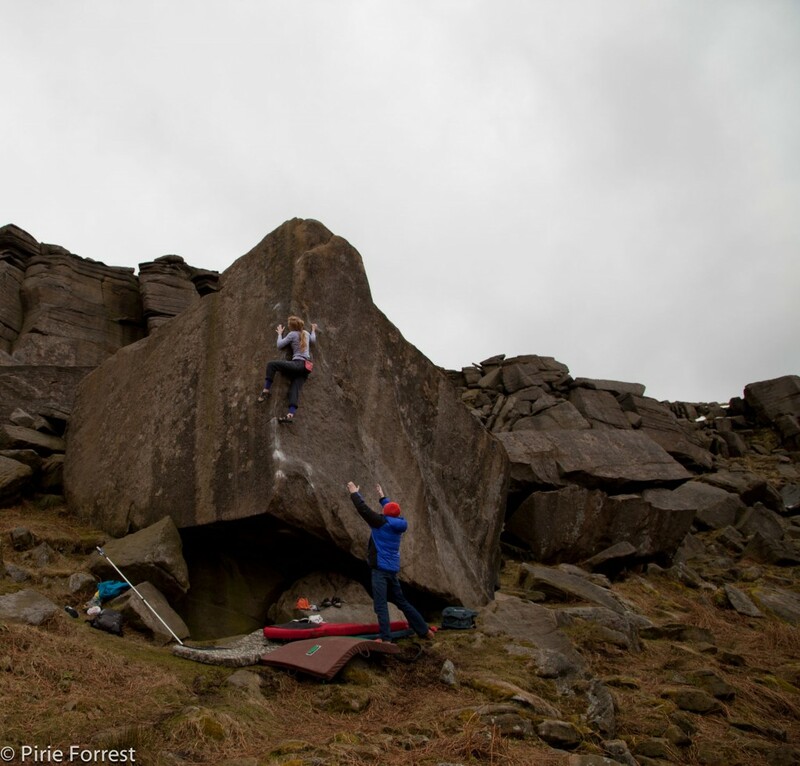 I have bouldered 8A and 8A+ but gritstone always felt like a different ball game. Then there is the height of it: somewhere in the region of 7-8m. An intimidating prospect to say the least, but it still was always in the back of my mind. It was first climbed by Ron Fawcett in 1987, the year I was born. Twenty-five years later and I was psyching myself up to have a go! 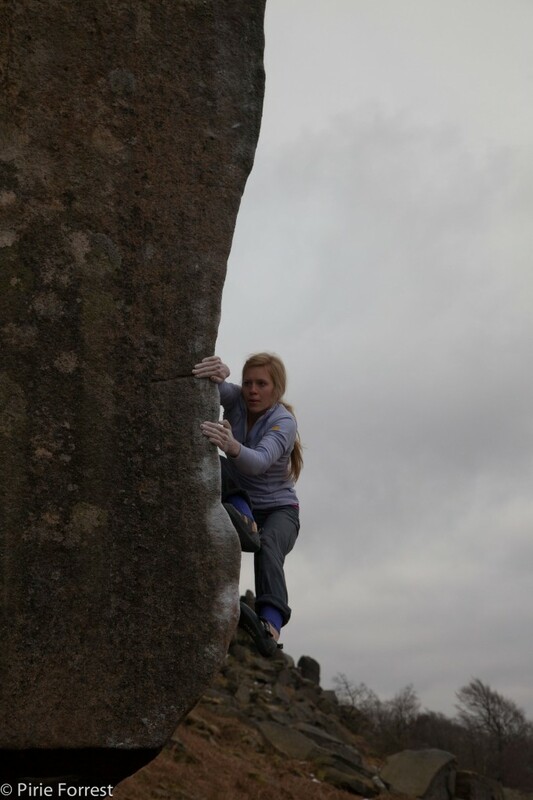 I decided to get stuck in and try it back in January and found that I was close to getting stood up on the arete – for those of you that do not know the climb, getting stood up is considered the hard part, the part that gets Careless Torque the grade it is assigned. The beginning section is burly and powerful whilst also being very technical and intuitive. This combination is probably what makes it feel so hard. However, I would add to the mix the word “knacky” (not sure that is actually a word…); once you have felt the correct position, it can become learnt. So, back in January, I got a glimpse of the feeling that it might work and the seed was sewn. Then it rained. And rained. And rained some more. Last week there was a break in the abysmal weather and I headed out with Will Atkinson and a young, budding film maker by the name of Nicholas Brown. It was about -2 degrees in the plantation car park, good conditions. I had warmed up at the Climbing Works and was ready to go. Three goes in, I found myself stood up on the arete of Careless Torque. I was surprised and, honestly, pretty scared! My first attempt at the top was slow and fumbling. I fell off but I knew what to do now and, having taken the fall that I was so frightened of, my nerves had settled. Psyche overtook fear and I rested up for another go. I shan’t bore you with all my attempts, I fell on the top section four times. It is certainly not over , the top is still hard and very committing. One time I fell with my hand touching the last hold, burnt by my own hesitation. That fall hurt a bit. Time was running out, we had to get going to get Nick to his hospital appointment, I had one more go. It’s funny how focus means you sometimes can’t remember things properly. The go I did it I was so “in the zone” that I can’t recall exactly what happened, except I didn’t fall off! It meant a lot to me to climb this line. 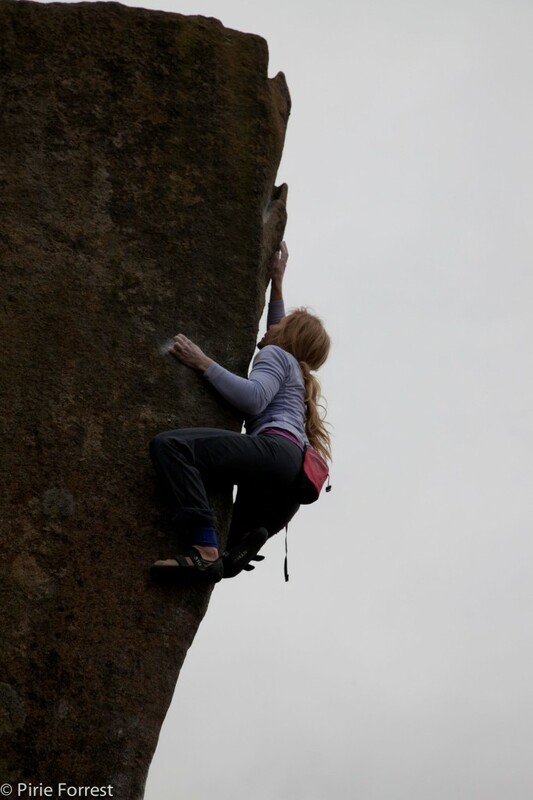 Not only was it a first female ascent but Careless is so many things; hard, scary, beautiful, historic, classic….I could go on. My best achievement so far? Yes I think maybe it is. Careless from a distance, Photo Pirie Forrest. Fantastic and really inspiring,.. historic even.